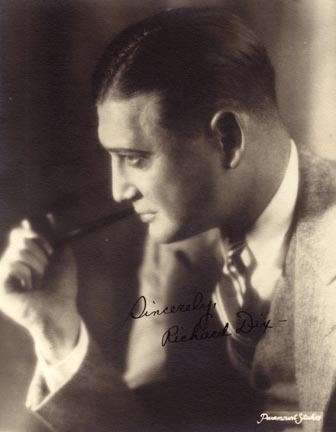 Richard Dix was born Ernst Carlton Brimmer on July 18, 1893, in St. Paul, Minnesota. According to his father's wishes, he studied to be a surgeon but found his talents more suited to the school's dramatic club. He also excelled in sports. After a year at the University of Minnesota, he worked in a bank, then for a local stock company, eventually getting acting work in New York. He went to Los Angeles and served as a leading man in the Morosco Stock Company which eventually led to a movie contract. Dix started making movies in 1917 and continued successfully into the sound era without as few major silent film stars were able to do. He was a well-known and popular western star. As matter of fact, one of his best known films was 1931's "Cimarron," a standout western that earned the Best Picture Academy Award and garnered Dix a nomination for best actor. After making over 50 silent films, he went on to make another 50-plus sound films - unfortunately, dying prematurely of a heart attack at age 56 in 1949, only two years after his retirement from films.